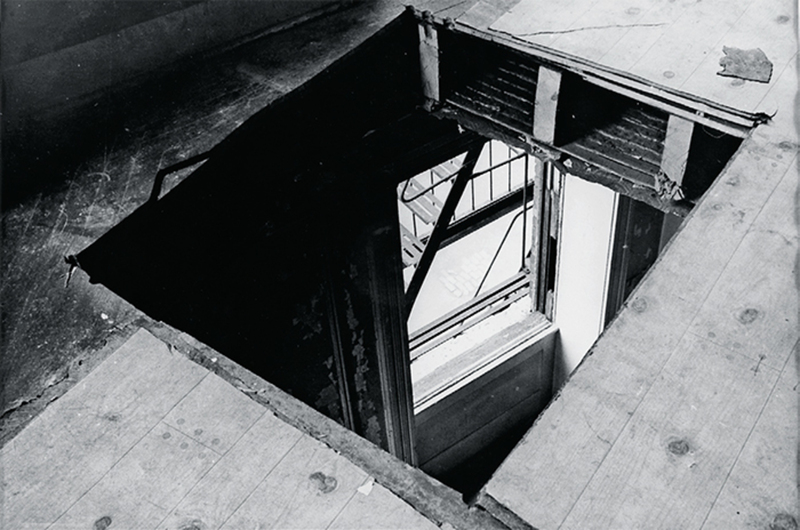 Gordon Matta-Clark, Bronx Floor: Boston Road, 1973, gelatin silver print, 11 × 13 7/8". This exhibition promises to explore dimensions of Matta-Clark only touched on in previous retrospectives, homing in on his architectural projects of the 1970s. The artist adopted the sobriquet anarchitect, with a bow to the art brut painter Jean Dubuffet and in explicit opposition to his professional education at Cornell. But the work to be exhibited in the Bronx this fallwhich will include preparatory drawings and documentation of his famous cuttings, including the highly complex incision through two seventeenth-century Parisian town houses that functioned as a viewfinder for the Centre Pompidou, then under constructionreveals a seriously competent architect’s eye. A large selection of Matta-Clark’s photography of walls and graffiti will demonstrate his considerable skill with that medium, too, and provide a record of his social and political activismrounding out our understanding of this mercurial figure as one of the late twentieth century’s most radical thinkers. Travels to the Jeu de Paume, Paris, June 4–Sept. 23, 2018; Kumu Kunstimuuseum, Tallinn, Estonia, Mar. 1–Aug. 4, 2019; Rose Art Museum, Waltham, MA, Sept. 12–Dec. 15, 2019.